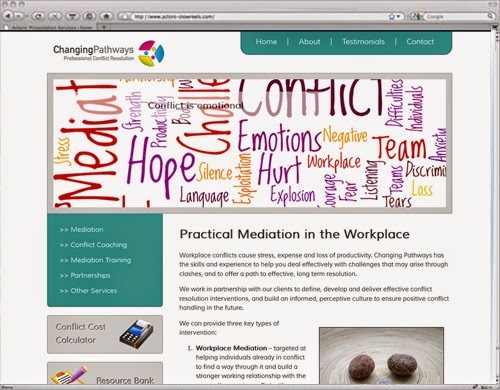 We were delighted when Changing Pathways was recommended to us by a good friend, to set up a website for his mediation business. Colin of Changing Pathways had a DIY website that was no longer meeting his needs, and he wanted something that would perform a bit better, and ensure he and his associates gave a strong impression online and got in front of the right clients. Colin offers a range of mediation services, including one-on-one, group, conflict coaching and mediation training. From chatting over coffee, we concluded that many companies and individuals don’t find it easy to quantify the costs of conflict and therefore don’t realise the full negative impact that disagreements and distress are having. Therefore, we decided to create a ‘cost of conflict calculator’, a simple online tool that HR managers and other related professionals could use to enter in the details of the conflict and get an estimated cost. This could be used simply to raise awareness of how such conflicts should not be ignored, and could also be used by managers to justify the budget required to mediate the conflict successfully. As well as the totally unique ‘cost of conflict calculator’ the web design needed to be calm, professional and give a sense of authority and knowledge without being overbearing. We helped design the logo and company literature and used a simple colour scheme with splashes of colour and bespoke illustrations to visually demonstrate the text content on the site itself. We also included a resource bank, which Colin can regularly add to in order to build trust and reputation though the website.